National Record Store Day is upon us, and for all of you crazy cats and kittens, it’s a time to appreciate that thing we love, music with the sweet, sweet sound of analog vinyl, a needle riding in the groove on a platter spinning round. Or, y’know, watches, because all we have is each other, and time. And in this case, Fossil and Crosley. Fossil and Crosley have teamed up to release co-branded watches and record players for National Record Store Day 2019. 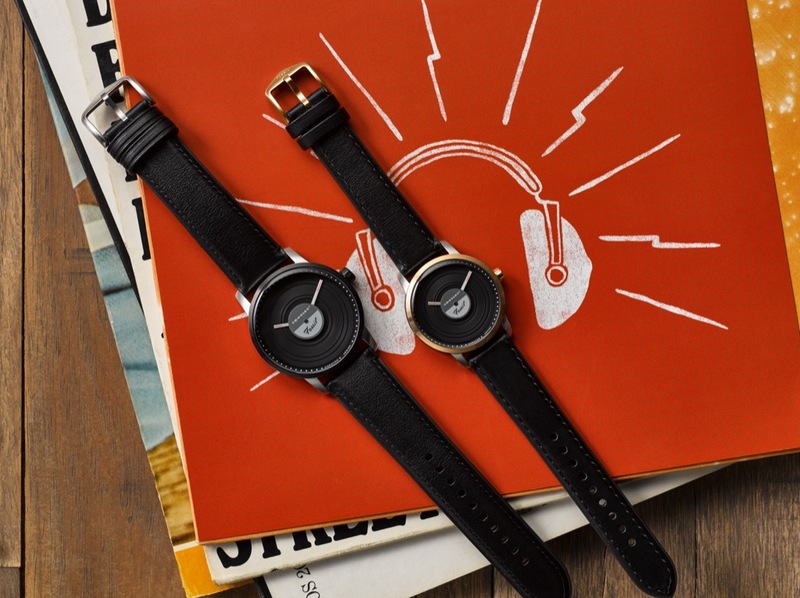 The watches are available in 36mm and 42mm, and use a dial like a grooved vinyl record, with a Crosley Fossil label in the center, and hands that feel a little like straight tone-arms. The seconds hand is the label as a spinning disc, so it looks like the record is spinning ’round in the case. The partnership continues with a Crosley x Fossil record player. The record player is two-tone, with details that match the watches. It also acts as a Bluetooth speaker, which is honestly better; Crosley record players have a reputation for having heavy tone arms with no way to adjust their weighting – the heavy needle is a good way to ruin records you care about. If you must get one, use Bluetooth (which we’d never recommend under normal circumstances, because Bluetooth is always a lowest-common-denominator mismatch between device and playback codecs. That is, your iPhone does AAC (good) and SBC (terrible), and the speaker does Apt-X and SBC. Or, the Android phone you’re using does Apt-X and the speaker does Apt-X HD and SBC – you’re going to get the lowest common denominator SBC codec. Nevermind all that. Get the watch instead. It’s a bit of whimsy combined with the reliability of quartz packaged up in a watch that recalls those earlier days, days that may have never been, outside of our collective memories. There are two models: A polished silver-colored mid-case with black bezel and sides reminiscent of stacks of records, equipped with silver-colored hands in 42mm (LE1060P). Likewise, there’s a rose gold colored bezel and hands model, the LE1061P, in 36mm. Pricing for either are $155 USD at Fossil. We are put on this earth to have a good time. Listen to good music, and wear good watches, with good people.